SAN FRANCISCO, California, April 9, 2012 (ENS) – A federal judge has ordered the California Department of Transportation, known as Caltrans, to revise its environmental analysis for the planned widening and realignment of Highway 101 where it bisects the old-growth redwoods of Richardson Grove State Park in Humboldt County. The decision, issued on April 4, comes in a 2010 lawsuit brought by a coalition of conservation groups and local community members seeking to halt the project. The lawsuit alleges violations of the National Environmental Policy Act, the Wild and Scenic Rivers Act and the Administrative Procedures Act. Conservation groups won a federal court injunction in July 2011 stopping the project from moving forward until the case could be heard. Citing errors in Caltrans’ mapping and measurement of these redwoods, U.S. District Judge William Alsup ordered Caltrans to correct its errors and prepare a detailed new analysis that considers potential harm to the roots of each individual redwood tree in the project’s path. The proposal to realign a section of Highway 101 to accommodate large-trucks would require extensive cutting into the roots of the redwoods along the highway. The conservation groups argue that root loss would kill some of the old trees, disrupt the habitat of threatened and endangered birds such as the marbled murrelet and northern spotted owl, and the remaining runs of imperiled salmon and steelhead. “Despite the importance of Richardson Grove and the incredible public outcry against this project, Caltrans didn’t even accurately measure and map the ancient redwood trees that its misguided highway expansion proposal puts at risk,” said Gary Hughes of the Environmental Protection Information Center, one of the plaintiff groups. Other plaintiffs in the case are the Center for Biological Diversity, Californians for Alternatives to Toxics, Bess Bair, Bruce Edwards, Loreen Eliason and Jeffrey Hedin. Also a plaintiff is Trisha Lee Lotus, the great granddaughter of Henry Devoy, who in 1922 transferred the redwood forest that became Richardson Grove State Park to California. Established in 1922, Richardson Grove State Park was recently rated as one of the top 100 state parks in the United States. The park attracts thousands of visitors from around the world every year to explore one of the last protected stands of accessible old-growth redwoods – some of the oldest living beings on the planet. Many local residents, business owners, conservation groups, economists and a consortium of 10 federally recognized Northern California tribes with longstanding ties to the grove also have expressed their opposition to the Caltrans road alteration plan. The plaintiffs argued that Caltrans’ environmental assessment failed to acknowledge the full extent of the project’s impacts, as required by federal and state laws, including the effects of cutting through and paving over the widespread but shallow network of roots holding Richardson Grove together, the consequences of stockpiling lead-contaminated soil in an area draining to the designated “wild and scenic” South Fork Eel River, and the impacts of opening the road to larger trucks. Caltrans also failed to adopt legally required measures to reduce these impacts and failed to consider less-damaging alternatives, the plaintiffs contend. In a statement to the court supporting the request for an injunction, University of California, Berkeley professor and registered forester Joe McBride concluded 108 trees would sustain damage, including fatal damage. “It is my opinion that this would, in turn cause negative impacts to the overall health of the forest in the vicinity of the Project area,” wrote McBride. Caltrans claims the road project is needed to legally accommodate large-truck travel on this section of highway. “Improvement of goods movement will help local businesses stay competitive in the marketplace,” says Caltrans. Caltrans says, “The truck restrictions at Richardson Grove are due to the tightness of the curves, making it difficult for longer trucks to stay within the traveled way. 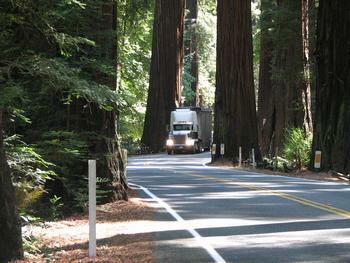 The 1.1 mile stretch of Richardson Grove is the only remaining location on Route 101 restricting access of STAA trucks traveling into Humboldt County from the south. But plaintiffs point out that Caltrans’ own statements and signage indicate that this portion of road is already designated for larger trucks. They allege that Caltrans has “exaggerated” potential safety problems and has not established that the project is necessary for safety or for goods movement and the economy. Since smaller commercial trucks already travel through the grove for Humboldt County deliveries, the plaintiffs say the best alternative would be to leave the highway as it is.